Detect salient objects and identify them using Darknet deep neural network. Darknet is a popular neural network framework. This module first finds the most conspicuous (salient) object in the scene, then identifies it using a deep neural network. It returns the top scoring candidates. See http://ilab.usc.edu/bu/ for more information about saliency detection, and https://pjreddie.com/darknet for more information about the Darknet deep neural network framework. This module runs a Darknet network on an image window around the most salient point and shows the top-scoring results. The network is currently a bit slow, hence it is only run once in a while. Point your camera towards some interesting object, and wait for Darknet to tell you what it found. The framerate figures shown at the bottom left of the display reflect the speed at which each new video frame from the camera is processed, but in this module this just amounts to computing the saliency map from the camera input, converting the input image to RGB, cropping it around the most salient location, sending it to the neural network for processing in a separate thread, and creating the demo display. Actual network inference speed (time taken to compute the predictions on one image crop) is shown at the bottom right. See below for how to trade-off speed and accuracy. Note that by default this module runs the Imagenet1k tiny Darknet (it can also run the slightly slower but a bit more accurate Darknet Reference network; see parameters). There are 1000 different kinds of objects (object classes) that this network can recognize (too long to list here). Sometimes it will make mistakes! The performance of darknet-tiny is about 58.7% correct (mean average precision) on the test set, and Darknet Reference is about 61.1% correct on the test set. This is when running these networks at 224x224 network input resolution (see parameter netin below). When using networks that are fully convolutional (as is the case for the default networks provided with this module), one can resize the network to any desired input size. The network size direcly affects both speed and accuracy. Larger networks run slower but are more accurate. with netin = (224 224), this module runs at about 450ms/prediction. with netin = (128 128), this module runs at about 180ms/prediction. Finally note that, when using video mappings with USB output, irrespective of foa and netin, the crop around the most salient image region (with size given by foa) will always also be rescaled so that, when placed to the right of the input image, it fills the desired USB output dims. For example, if camera mode is 320x240 and USB output size is 544x240, then the attended and recognized object will be rescaled to 224x224 (since 224 = 544-320) for display purposes only. This is so that one does not need to change USB video resolution while playing with different values of foa and netin live. Definition at line 126 of file DarknetSaliency.C. Definition at line 133 of file DarknetSaliency.C. Definition at line 142 of file DarknetSaliency.C. Helper function: compute saliency ROI in a thread, return top-left corner and size. Definition at line 156 of file DarknetSaliency.C. References jevois::RawImage::height, itsSaliency, and jevois::RawImage::width. Definition at line 148 of file DarknetSaliency.C. Definition at line 189 of file DarknetSaliency.C. 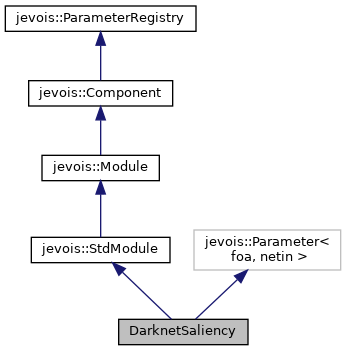 References jevois::rawimage::cvImage(), getSalROI(), jevois::RawImage::height, itsDarknet, itsResults, LINFO, jevois::rescaleCv(), jevois::StdModule::sendSerialObjDetImg2D(), and jevois::RawImage::width. Definition at line 232 of file DarknetSaliency.C. References jevois::rawimage::convertCvRGBtoCvYUYV(), jevois::rawimage::cvImage(), jevois::rawimage::drawFilledRect(), jevois::rawimage::drawRect(), getSalROI(), jevois::RawImage::height, itsCvImg, itsDarknet, itsPredictFut, itsRawInputCv, itsRawPrevOutputCv, itsResults, jevois::rawimage::paste(), jevois::RawImage::require(), jevois::rescaleCv(), jevois::StdModule::sendSerialObjDetImg2D(), jevois::sformat(), jevois::Timer::start(), jevois::Timer::stop(), success, to_string(), jevois::RawImage::width, and jevois::rawimage::writeText(). References jevois::rawimage::convertCvRGBtoCvYUYV(), jevois::rawimage::cvImage(), jevois::rawimage::drawFilledRect(), jevois::rawimage::drawRect(), getSalROI(), jevois::RawImage::height, itsCvImg, itsDarknet, itsPredictFut, itsRawInputCv, itsRawPrevOutputCv, itsResults, itsSaliency, JEVOIS_REGISTER_MODULE(), jevois::rawimage::paste(), jevois::RawImage::require(), jevois::rescaleCv(), jevois::StdModule::sendSerialObjDetImg2D(), jevois::sformat(), jevois::Timer::start(), jevois::Timer::stop(), success, to_string(), jevois::RawImage::width, and jevois::rawimage::writeText(). Definition at line 382 of file DarknetSaliency.C. Definition at line 378 of file DarknetSaliency.C. Referenced by DarknetSaliency(), and process(). Definition at line 380 of file DarknetSaliency.C. Definition at line 381 of file DarknetSaliency.C. Definition at line 383 of file DarknetSaliency.C. Definition at line 379 of file DarknetSaliency.C. Definition at line 377 of file DarknetSaliency.C. Referenced by DarknetSaliency(), getSalROI(), and process().